Veritas Academy in Savannah has a new guest writer blog & you will appreciate the moving piece on it about adoption by pastor David Cleland of Savannah’s Hope Bible Church. 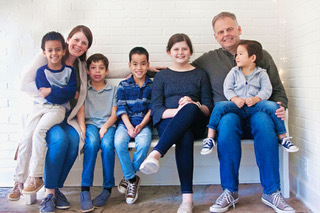 Pastor Cleland & his wife have adopted five children. FIVE. That is simply beyond impressive. Read it here. Veritas Academy in Savannah offers a distinctive combination of substantive academics, genuine Christ-centered culture, and a format that tangibly engages the family. Stay connected with Veritas Academy by liking their page on Facebook here. On Instagram here. This entry was posted on Wednesday, October 24th, 2018 at 4:16 pm	and is filed under Foster Family, Outreach, Schools/Childcare, Veritas Academy. You can follow any responses to this entry through the RSS 2.0 feed. Both comments and pings are currently closed.